Bisadora is one of those labels that never tries to be anything it's not. It's cheap and cheerful, and with bags like the Furrette Tote it revels in that status. We often pick apart faux reptilian finishes, stating that there's no way a fashion aficionado would ever fall for the exotic mimic. But clearly Bisadora doesn't care about authenticity. Why else would it make its scaly surface furry? And then render it in an unnatural shade of cranberry? It could never come from any real life animal, but who cares? The color is vibrant and the finish feels wonderful to touch, so it's a bit of a guilty pleasure. Such an unlikely surface could have overwhelmed a bag, so Bisadora plays it safe and opts for a traditional boxy shape. Yes it's a bit ho-hum, but I hate to think what this tote would look like if Bisadora had opted for any more flair! This tote's design is unexpectedly smart for this price. A zippered pocket running down the center divides the interior into three. Stash your valuables in the middle portion, and leave the items you need on hand down the sides. There are smaller pockets there and even a clear vinyl window for your ID or business card. 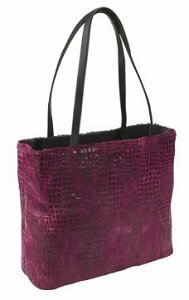 I know many fashion snobs will turn their nose up at this tote, but if you can embrace recession-chic it might be the bag for you at $59. The Bisadora Furrette hobo bag, a great alternative to this tote bag.